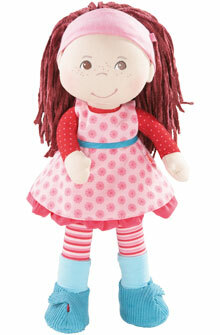 HABA 3944 - Hello, I'm Clara. Do you want to have a picnic with me? We just need a big blanket and we are set. Clara is a 13.5" soft body doll. She comes with a dress, a pair of socks and shoes, and a hair band.